Making red beans and rice is a beloved ritual and tradition in New Orleans, and for many, prepping the beans and vegetables and gently coaxing that pot of goodness into a state of creamy perfection is both a pleasurable experience and a bit of kitchen therapy. Give someone the essentials for #RedBeansDoneRight with our Red Bean Monday Gift Basket, featuring our signature Red Kidney Beans and Cajun Country Rice. 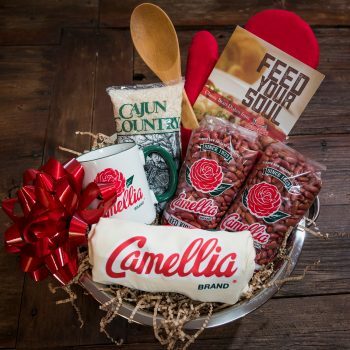 This gift basket is also overflowing with great Camellia branded merchandise for the kitchen – like our cookbook, apron, oven mitt, mug, and wooden spoon. They’ll be cooking up Camellia’s Famous New Orleans-Style Red Beans and Rice before they know it.